Are you tired of composing your shots? Do you struggle finding the perfect settings to take your photos only to come home and find out that your shot is slightly out of focus? Do you wish that you could see different depths of field in your photos to explore new creative outlooks? A ll of this is now made possible with the Lytro, an innovative camera made by Lytro Inc.
Ladies and Gentlemen, the future of photography is here. The Lytro Camera will be the first light-field camera available to consumers. The idea of the camera is that there are numerous light sensors that absorb light from the surrounding area, which allows for more accurate recreations of images. This product does not have a specific target audience, since it is the first product of its kind. Amateur photographers will like the idea that they can create stunning image without having to learn about aperture, shutter speed, and other camera jargon settings. Professional photographers will take accept the challenge of having to think in a three dimensional plane. 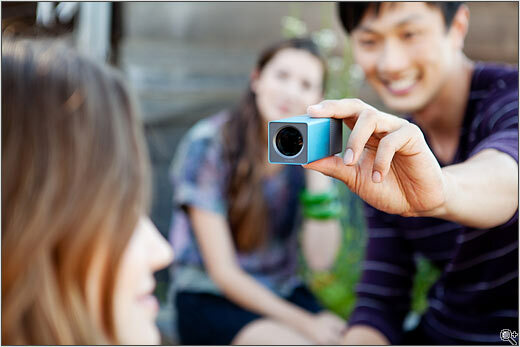 The Lytro Camera will be able to revolutionize the field of photography and blur the gap between reality and images. The camera features an 8x optical zoom and a f/2 aperture, which will allow for a vast amount of light to enter the camera. The most important detail about this camera is the fact that you can focus and refocus the photo as many times as you like. Additionally, it is possible to zoom into photos and zoom out after the shot has been taken. This is amazing, because any time there is a photograph and something interests you in the background you will be able to refocus and zoom in on to it. The actual size of the camera is very small, in fact it weighs less than 8 ounces. The Lytro Camera is lacking in features that are apparent in dSLRS and is more akin to a point and shoot. It could be considered a super powered portable point in shoot in that regard. The camera also supposedly will be able to turn on much faster than a standard camera, because of its simple design allowing you to take quick photos of surprising situations. With just two fingers you can recreate any situation! Currently, the Lytro is still under development, but there is a gallery online where you can view the technology in the photographs. As of this point it is only Mac compatible, which is strange as there isn’t very many Mac only programs. Lytro Inc has plans to develop Windows capability and is pushing for it to be released near early 2012. Also, there is currently no video available with this camera, which has been a feature in virtually every camera released in the past five years. The camera is also very heavily reliant on software, which means that it will be virtually impossible to edit photos with traditional photo editing software. The Lytro Camera appears to be an innovative new product. However, it is not currently being manufactured for the public. It is set to be released in early 2012 which is in a few months. If you go to the company’s site you can pre-order the camera for around $400-500 as long as you live in the United States. Currently, there is a one camera order limit per person. This product looks interesting and has the possibility to change the way of photography. I think that it would be best to keep an eye out for Lytro products in the future and wait on purchasing the camera until the next model version of it comes out.